Wot no Prog Rock tag ? I’m pretty sure this is a Brian Pern Album . This – THIS – is what happens when you get your glockenspiel and xylophone identification mixed up. Pat Sharp and Neil Morrissey form a Mumford and Sons tribute band. Audience reception is unfavourable. Imagine that at some point, a young awkward girl who plays the xylophone saw this cover and gasped. Monty Python should’ve covered this. @AnnaT: how do you know she is a witch? “My Fanny’s Demon” is more like it, as the witch clearly has a (fire) bug up her arse. @B.Chiclitz: this being a British-run site, that’s not where the bug would be. Exorcism by fire and xylophone! That’s a thought! @Tat Wood—I’ve always liked the xylophone part in that tune. @B.Chiclitz: Dave Stewart and Barbara Gaskin mixed it fairly well down but it’s there if you listen closely. @Tat Wood—I was thinking of the Lesley Gore version (1964). Mixed way up there. This cover is giving me some bad vibes. yo SALEM!!! Are you ready to ROCK?!! @DSWBT: It’s a medieval-looking village, with a great big bonfire in the square, and the people present don’t look especially joyous. Also, check out that person with the crazy white hair who’s pointing. Of COURSE it’s a bloody witch burning! What happens when you play the xylophone backwards. @AnnaT: Ah, but can you not also burn bridges? 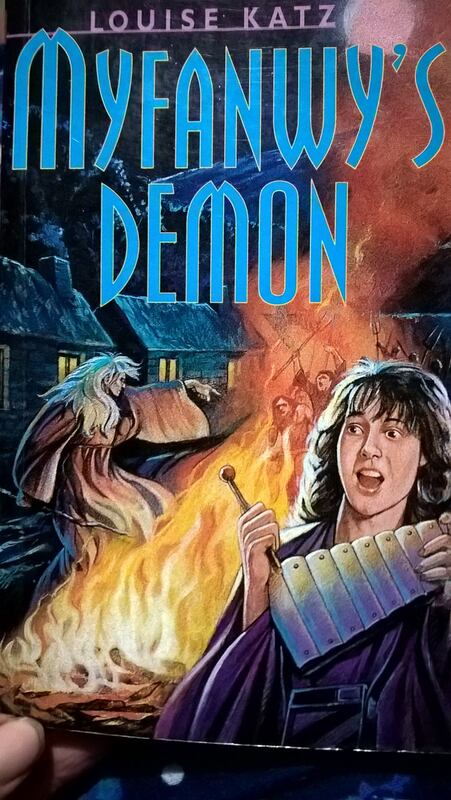 Guesses, anyone, on what the xylophone player is looking at that’s more exciting than a demon witch burning? Does the demon belong to Myfanwy the Welsh goddess or Myfanwy the pterodactyl from Torchwood? I would so like it to be the latter.